A colleague suggested that I consider another hotel if staying longer than a few days, so I planned to move on. 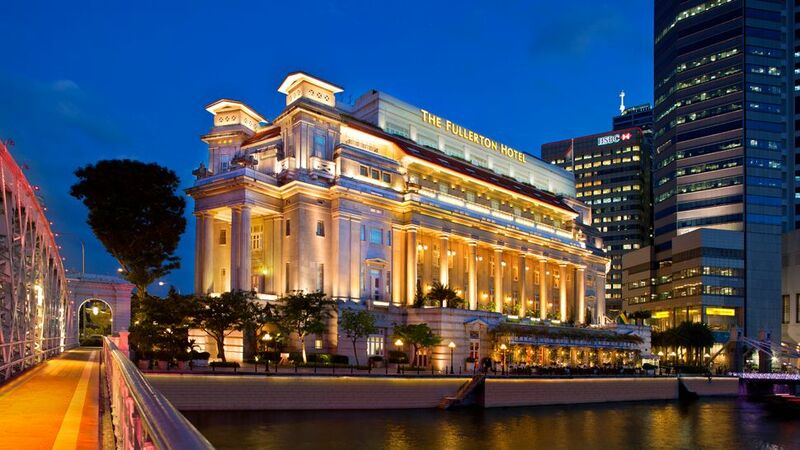 I headed next to the Fullerton Hotel. 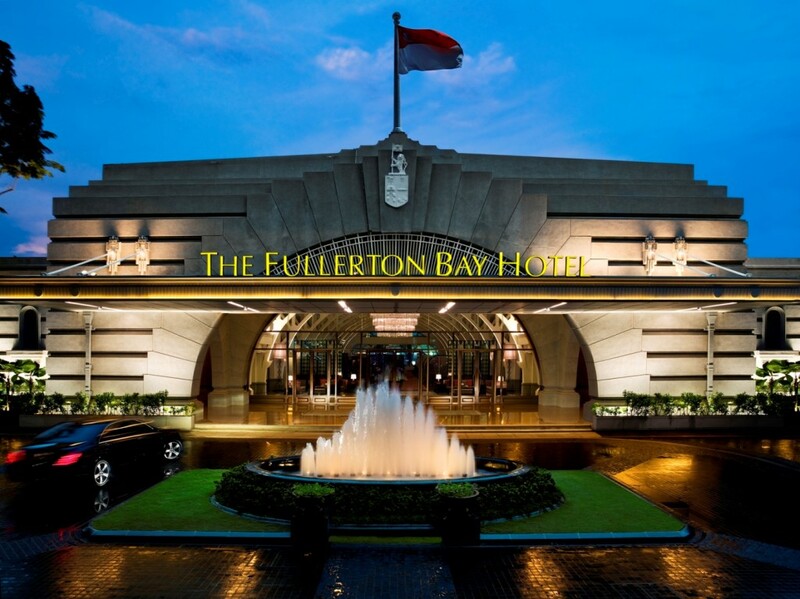 It was 3 p.m. when I arrived at the Fullerton, where I promptly became involved in a complimentary, one-hour tour of the hotel and grounds, the Heritage Tour. Afterwards, I walked to the esplanade to see a performance. A breezy walk across the bridge on the bay was refreshing and upon returning that evening, I realized what a nice “personality” the hotel had. The entrance was certainly impressive, since this had once been the post office, and a very auspiciously-designed postal building it was! My loft suite was stunning, with French windows facing the bay. After a moment of relaxation, I, once again, went in search of a pool. This pool was called, “The Infinity Pool.” Since it doesn’t have an “edge” on a roof, it makes sense that the word is omitted. This pool overlooked the river. What a lovely experience – and no sense of vertigo this time! Dinner at “The Lighthouse” was delicious, with Garoupa and vegetables, then a nice cannoli with ice cream to finish. The view of Marina Bay Sands reminded me of my experiences earlier on. At 8:00, I was in for a spectacular surprise! The light show with music began over the water and lasted for 15 minutes. The next morning, I headed to the Asian Civilization Museum, a point of intrigue since my stay several years ago at the Eastern and Oriental Hotel in Penang. This museum is just a quick walk away from the Fullerton Hotel. I had visited Chung Keng Quee’s house in Penang several years ago and had become quite interested in the “Peranakan.” This museum had over 1300 artefacts on display. I was set on exploring the 15th century Peranakan exhibit with its recreation of a monumental altar from a Singapore family. 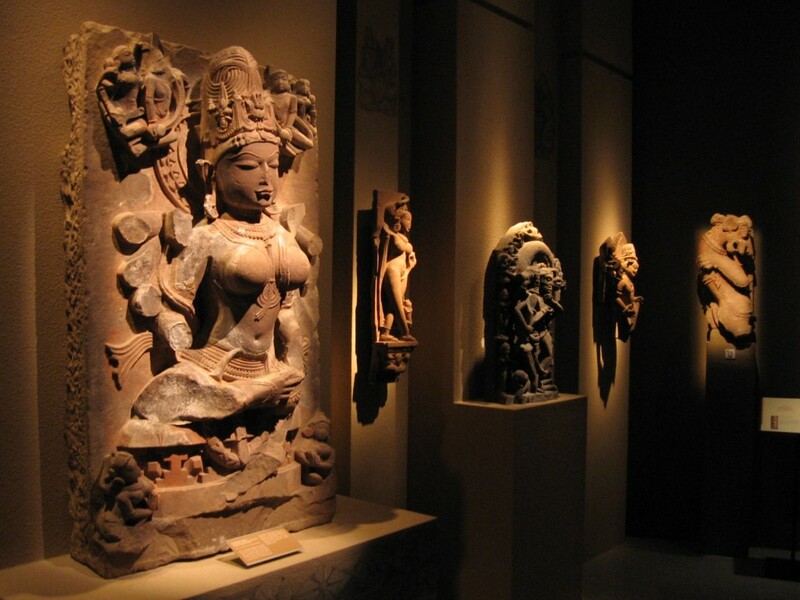 I was also keen on visiting the ongoing exhibit on Batak Sculpture from Northern Sumatra. My morning was a success, and I came out with a little clearer concept of the Peranakan and their struggles and achievements. I returned in the afternoon, and as I was leaving, I enjoyed afternoon tea and had a haircut at the Salon de Florere. Taking in my surroundings on checkout, I noticed just how stunning the lobby and public areas were. I decided to venture on to Fullerton Bay Hotel, the sister property. I found this hotel to have a boutique atmosphere, exuding quality and style. The hotel is an exquisite estate in the heart of Singapore. A long hall leads to the Landing Point Restaurant, overlooking the bay. The floor is inlaid with glittering mosaic tiles, and public spaces display historic black-and-white photos of the area and vintage travelling chests. In my deluxe room, I found a remarkable view of Singapore, including, once again, the Marina Bay Sands. I also noted the beautiful colonial interior. I enjoyed dinner in the hotel’s alternate restaurant, The Clifford, and then explored the area which was riddled with landmarks: the first MRT station, Singapore’s eye, the Merlion, Singapore’s mascot, and the esplanade. My day, needless to say, ended with cool laps in the hotel’s rooftop pool against the brilliant lights of this fascinating city. I noticed as I was offered a hand at every turn that this hotel was beautifully-appointed, and staff catered to every need. Luxury was evident at breakfast in The Landing Point where I indulged in lox and bagels, cappuccino and fresh lychees. I was comfortable and felt relaxed and appreciated, but I felt it might be time to explore again. The Singapore people are well-known for saying, “Life is too short to be spent doing just one thing.” Luxury is all about being better off than we are, so let’s continue exploring the hotels that had dreams behind them!